The first, most obvious, and yet most overlooked issue is the strings. Old strings lose their elasticity and are affected by skin acids and oils, everyday dirt and dust, and they can have flat spots worn into them by the frets. It is all but impossible for old strings to stay in tune. “Old strings don’t sing!” Change your strings often. How often depends on how often you play. I change mine ever 15 or 20 hours playing time, or before or after a gig, but that’s more often than most people need to do. for most home players, 40 or even 50 hours playing time between string changes is probably fine. If on average you play for 30 minutes twice a week, 50 hours playing would be nearly a year. Assuming that you have fresh strings, correctly installed and stretched-in, and that there are no other issues with the guitar’s hardware, (e.g. cheap or damaged tuning pegs) if you still have tuning issues, our no. 1 suspect is always friction. While this is a particularly problem with tremolo-equipped electric guitars, friction can affect any electric or acoustic instrument, particularly where the nut and string trees are concerned. So read on, even if you are not a whammy bar user. Every time we use our play hard, bend strings, retune to an alternate tuning, or use our whammy bar, the strings move back and forth a little through the nut slots and across the saddles and string trees. Sometimes we can hear a little ‘ping’, ‘plink’ or creak when we tune, or wiggle the whammy bar. That little ‘ping’ happens when the string was not able to move freely. It was caught and suddenly released, and that means friction is a problem. If everything is to stay in tune when it should do, the strings must return to their original position, when everything was ‘at rest’. That means we have to remove the friction. The fix is easy – apply a little lubrication to the nut slots, saddles, and string trees (if you have any). Some tremolo-equipped guitars can also benefit from a yearly clean and lube of the tremolo mounting posts/screws and knife edges. There is a wealth of choices for your lubricant and you can use whatever is easiest or most convenient. There is no reason to run out and buy expensive speciality products marketed at guitar players. Great choices can be found around the home or at local stores – chapstick/lip balm, graphite (pencil lead), vaseline, or white lithium grease are the most common choices. I’ve used them all at one time or another and they all work great. Some recommend mineral oil (e.g. 3-n-1 oil), but liquid oils can be messy and people often use too much. With so many great non-runny options, there really is little reason to use it. Lithium grease, vaseline, and lip balm are easy to apply in small amounts. I recommend a pin or needle, or tip of a toothpick, or better still the edge of a piece of card or paper. A soft-leaded pencil can be quite easy to apply and works well but it will leave black marks on a white nut or saddle. My personal favourite is white lithium grease. 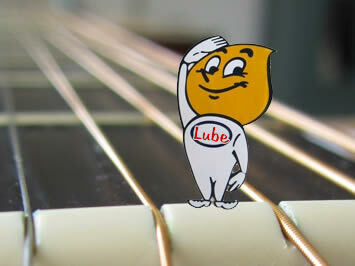 Aside from being a fantastic lubricant, it is easy to apply in small amounts, and it won’t run. It is an ideal choice for metal/metal and metal/plastic bearing surfaces, which is precisely the situation we face with guitar strings in contact with nuts, saddles, and string trees. A 40 g (1.5 oz) tube will cost very little and last a long time. You can find it in home improvement/DIY stores or through specialist cyclist stores (they use it for lubricating wheel bearings). I also keep a tube of lip balm in my guitar case for emergencies. Lubrication is such a simple thing to add to our string change routine, yet it can make a big difference to tuning stability. No matter what kind of instrument you have, tremolo-equipped electric guitars, fixed bridge electrics, semi-acoustic, acoustics, even bass guitars, banjos, mandolins and ukuleles, a little lube goes a long way and makes life a lot easier! Check out my tremolo tuning stability checklist too.